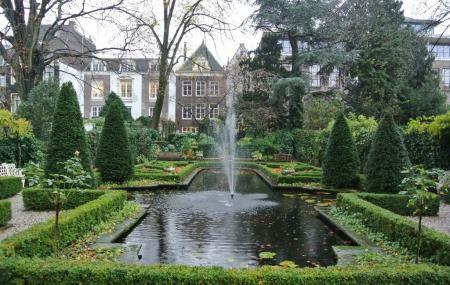 Museum Geelvinck-Hinlopen is a picturesque canal side mansion in Amsterdam. The destination offers some of the most amazing interiors and architecture in the city. There is a spacious and lush green garden outside the mansion which makes the whole scene of the place complete. A place of peace, serenity and tranquility is what the museum offers. There are even volunteers in the museum that can give you all the information that you need about the mansion. FREE entry to children 0-5 / Iamsterdam City Card / Museumkaart holders. Take a tram from Amsterdam, Keizersgracht (Vijzelstraat). Small but nice. Very informative staff who gives a private tour probably because they are bored. Didn't get 5 stars because we couldn't go upstairs. A beautiful inner yard garden. The staff is very friendly and helpful. Erg klein en niet al teveel te zien. Wel vriendelijk en behulpzaam personeel. Ik had misschien wel pech dat er juist geen tijdelijke tentoonstelling aan de gang was; anders was er meer te zien geweest. Maar dan nog is dit niet echt de inkomprijs waard!